During the past few years, interest in the use of thermography for home and building inspections has increased dramatically. Rising energy prices, consumer demand, and lower infrared equipment costs have led many home and building inspectors to consider adding infrared inspections to their service offerings. In addition to increased diagnostic capabilities, thermographers with the proper equipment, training, and experience can enjoy increased revenue and profits. 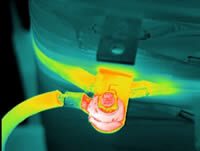 This course provides an introduction to infrared thermography, how it is applied to buildings and building subsystems, along with ways to ensure one’s future success. This material is intended for anyone wishing to understand the application, uses, and benefits of infrared thermography for home and building inspections. Course is designed for home and building inspectors, professional thermographers, and damage restoration experts.